An immigrant minority population can be successfully integrated into a nation-state’s larger society through two ways: first, by the immigrants’ consensual assimilation into the prevalent national identity; and second, by the nation-state’s inclusion of the immigrants’ culture into the prevalent national identity. Within the French context of Muslim integration, the first possibility has arguably achieved mixed levels of success. However, the latter possibility has had little to no success. Ultimately, full integration is stunted by the following factors: first, the French state’s aggressive secularism; second, the exclusion of the Muslim population in the conception of France’s national identity; and third, the French state’s adherence to a patriarchal society. Overall, Muslim integration in France has been relatively unsuccessful. Controversial French policies, such as the ban of headscarves at public schools and burkas in public spaces, have been the result of unsuccessful Muslim integration. These policies have further exacerbated religious and ethnic tensions and delay successful full integration. Consensual assimilation, the first possibility for successful integration, has arguably achieved mixed levels of success. Evidence positively supporting integration includes a substantial percentage of the Muslim population displaying “remarkable willingness and capacity to assimilate”; for example, French Muslims have “one of the highest rates of intermarriage for Muslims anywhere in Europe.” (Giry, 93). Perhaps more significant is that “roughly equal numbers of French Muslims self-identify first as national citizens as opposed to Muslims.” (Leane, 1037) However, the burka ban enacted in 2011 provides evidence contrary to successful integration (Bilefsky,). Though admittedly only affecting a small portion of the population (2,000 of 65 million Muslim women in France), the burka ban encourages coercive assimilation (Leane, 1056). Women caught wearing burkas in public spaces risk a €150 ($205) fine and can be ordered to take a class on the country’s republican values. (Steinhauser, Gabriele, and Inti Landauro) Muslim women abiding to this law cannot necessarily qualify as consensual assimilation because the law’s system of punishment is coercive in nature. It cannot be known whether the motivation for compliance is, in fact, consensual assimilation, or simply fear of punishment. France’s intolerance for multiculturalism makes it difficult to incorporate Muslim culture into the prevalent national identity. This can be explained by its history of aggressive secularism. Aggressive secularism in France can be traced back to the French Revolution of 1789. It produced a French Republic with an antagonistic view towards the Church and Christianity, primarily because of their connections with the Ancien Régime (Leane 1041). Although the Ancien Régime had been dismantled, allowing Christianity to maintain its considerable influence in French society – strong enough to be considered a “cultural legacy” – was not ideal (Leane 1041). Therefore, “[t]he new French Republic sought simply to destroy the Catholic Church in France” (Leane 1041). The state “confiscated church property”, “dissolved all religious congregations”, “reorganized the church” and most significantly, “required clergy to take an oath of loyalty to the French state” (Leane 2014). Just as how, in 1795, a citizen wearing a Christian rosary was seen as a threat, a woman wearing a Muslim burka today is interpreted as being loyal to Islam rather than the French state. In a way, the French state can be analogous to a dictatorship with a single party system; the State is the single party that prohibits religion, the threatening competitor, to enter the party system. Recent policies such as the burka ban indicate the French state has a particular discomfort with the Muslim population. While the ban on headscarves for schoolgirls targeted other religious groups such as Jews and Sikhs in addition to Muslims, the burka ban singles Muslim women (Leane 1052). A noticeable Muslim population first appeared in France as migrant workers during the post-war boom. This is significant for two reasons: one, it implies that there was no Muslim population at the conception of the French nation-state; and two, the greater French society initially viewed Muslims as migrant workers rather than permanent citizens. The burka ban exclusively attacks the female Muslim population. It is important to consider why a law specifically targeting Muslim women, and not the entire Muslim population, has been enacted. For successful Muslim integration, women wearing burkas must be accepted in the prevalent French national identity. The French state justifies banning burkas through patriarchal norms. This implies that burkas are unable to be accepted into the French national identity because doing so would go against the French patriarchy. While burkas may not have been banned with the intention of preserving patriarchal norms, the effects of the ban have reinforced patriarchy in France. A popular justification behind the veil prohibitions is based on the assumption that Muslim women are being forced to wear veils by males. Ignoring the irony that the French state is in turn doing the same thing, but in the negative – forcing women to not wear the veil – the French state’s force is supposedly backed by superior moral intent, in that the women being forced to wear the burka are being forced into a “repressive form of Islam that demeans and almost literally imprisons them” (Leane 113). However, continuing this assumption, the veil prohibition will prove more detrimental than helpful in liberating Muslim women. Rather than “emancipate [Muslim women] from the suffocating grips of their husbands, families, selectively interpreted dogma from clergy, or whatever the source of oppression”, the bans “achieve the contrary effect of driving them and their families closer to the very fundamentalism that the ban seeks to discourage.” (Leane 113) If these women are already in subordinate positions, it is naïve to think banning burkas, the supposed methods of imprisonment, will miraculously liberate the women. What is more likely to happen is that the women will be confined to the private sphere of their homes, where they will not only be under constant surveillance from repressive forces but unable to engage with the public sphere. These women would consequently lose opportunities provided by the public sphere, such as education, that could more efficiently help them escape harmful situations. Not only do the burka bans reinforce patriarchal norms, it exacerbates the issue of Muslim integration by further excluding Muslim women from the French public sphere and national identity. The minority immigrant population of a nation-state can be successfully integrated into greater society through two different ways. In the context of Muslim integration in France, the first, which involves consensual assimilation by the immigrant population, has arguably achieved mixed levels of success. The second method, which involves the inclusion of the minority population’s culture by the greater society into the national identity, has been relatively unsuccessful. A variety of factors contribute to its explanation, including the French state’s aggressive secularism, the exclusion of the Muslim population in France’s national identity, and the maintenance of patriarchal norms in French society. In conclusion, Muslim integration in France has been relatively unsuccessful, and, reflecting this result, has produced laws banning Muslim veils. [footnote]Ajrouch, Kristine J. “Global Contexts and the Veil: Muslim Integration in the United States and France.” Sociology of Religion 68.3, Muslim Integration in the United States and France (2007): 321-25. JSTOR. Web. [footnote]Bertrand, Jean René. “State and Church in France: Regulation and Negotiation.” GeoJournal 67.4, The Political Geography of Religion: Historical State-church Relations in Europe and Recent Challenges (2006): 295-306.JSTOR. Web. [footnote] Bilefsky, Dan. “France Moves to Clarify the Rules on Full Veil.” The New York Times. The New York Times, 20 Oct. 2014. Web. 04 Dec. 2014. [footnote]Giry, Stéphanie. “France and Its Muslims.” Foreign Affairs 85.5 (2006): 87-104. JSTOR. Web. [footnote]Ivekovic, Rada. “The Veil in France: Secularism, Nation, Women.” Economic and Political Weekly 39.11 (2004): 1117-119. JSTOR. Web. [footnote]Karouni, Ilyess El. “Ethnic Minorities and Integration Process in France and the Netherlands: An Institutionalist Perspective.” American Journal of Economics and Sociology 71.1 (2012): 151-83. JSTOR. Web. [footnote]Kesselman, Mark. “France: Representation and Participation.” European Politics in Transition. 6th ed. Belmont: Wadsworth, 2009. 148-63. Print. [footnote]Leane, Geoffrey W.g. “Rights of Ethnic Minorities in Liberal Democracies: Has France Gone Too Far in Banning Muslim Women from Wearing the Burka?” Human Rights Quarterly 33.4 (2011): 1032-061. JSTOR. Web. [footnote]Najmabadi, Afsaneh. “Gender and Secularism of Modernity: How Can a Muslim Woman Be French?” Feminist Studies 32.2 (2006): 239-55. JSTOR. Web. [footnote]Steinhauser, Gabriele, and Inti Landauro. 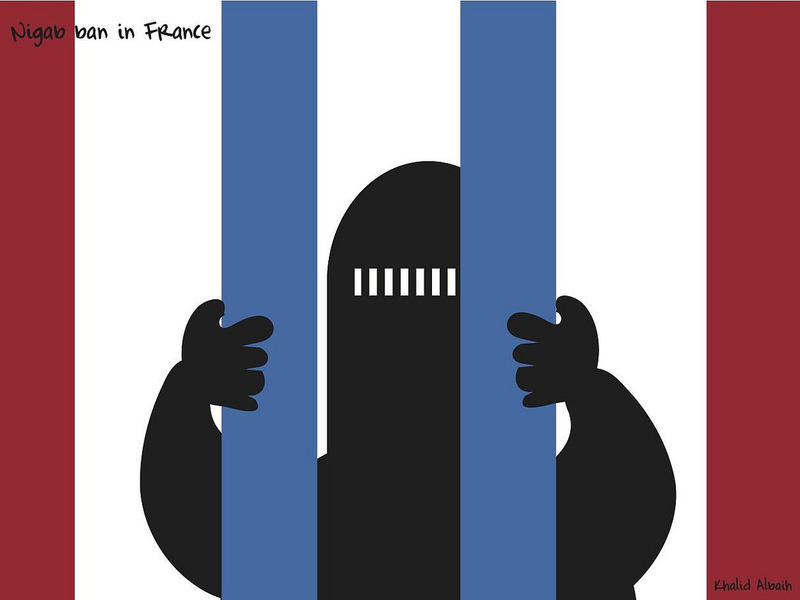 “European Human Rights Court Upholds France’s Burqa Ban.” The Wall Street Journal. Dow Jones & Company, 1 July 2014. Web.